The French have done it again. Provence is the home of perfume, lavender fields, wine and truffles. But Provence holds another hidden treasure that is found near the small town of Apt, some 50km north of Aix-en-Provence, this treasure is the clay mines of Les Argiles du Soleil. Clay mining has long been a tradition within the district, with evidence of the first quarries being developed in the Roman times. Early discoveries of clay lead to its use in pottery and brickwork. And later, the 18th century style earthenware of La Faïence d’Apt, became famous for its unusual and elegant designs due to the use of a transparent glaze that allowed the natural swirls and hues of the land to show through. These hues are still a feature today, with the harvesting of an assortment of coloured clays that are prized in the luxury cosmetic and spa industries. Les Argiles du Soleil clay quarries are worked by locals. Quarrying, handling, crushing and drying are all carried out under strict supervision to ensure the products meet the highest of industry standards. The mine locations are selected by specialist technicians who undertake a range of quality and conformity controls to test the mineral compositions prior to giving mining approval. Each deposit has potential to be mined for approximately 350-400 years. Regular checks take place to monitor quality and environmental impact. which helps to improve circulation, making the skin more radiant. high silica and mineral salt content and acts as a skin softener. perfect for both. The extraction of the clay occurs between 50-250cms of soil to minimise environmental disturbance. Once harvested, the clay is left to dry in the warm sunshine, after drying it is crushed into a superfine grade and then packaged into bags. Other than the evaporation of moisture, not a single part of this soil is discarded. The final product is laboratory tested and analysed by both Les Argiles Du Soleil and a third party external testing facility to ensure the clay conforms to the quality control standards of the French Pharmacopeia V 2.1.8. Les Argiles du Soleil clays are recognised by international certification bodies such as Ecocert and Nature et Progrès as an accepted organic ingredient. This recognition is due to the clays being sun-dried rather than by radiation and because they have not come into contact with any plastic or metal. Consequently, this is positive news for those formulating certified organic cosmetics. 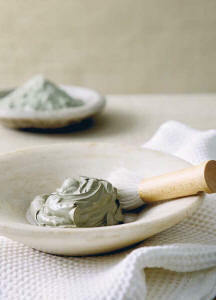 As the clays can provide natural colorants for creams and lotions as well as the obvious mud-mask applications. With France being world leaders in spa treatments and cosmetic engineering, it comes as no surprise that they also produce the world’s finest quality clay.